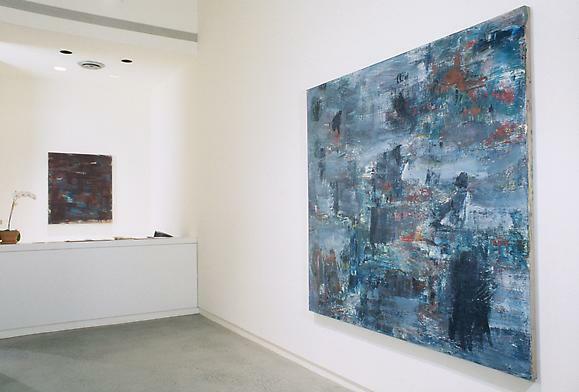 "Louise Fishman has been searchingly committed to abstract painting for well over 30 years, yet in a way there is nothing "abstract" about her paintings. They are not abstract-expressionist "landscapes," or pared-down images of one thing or another with the details simply "abstracted" out of them or refined away. Fishman's painting is not a kind of summary of a more fully described image from which it has fastidiously withdrawn itself, as may be the case for Mondrian or Kelly, say, (artists whose work has been important to her). The word "abstract" derives from the Latin for "to draw away" (abs-trahere), whereas a Fishman is at no remove from anything, but is complete and real in itself. It is, in the largest sense, concrete (from concrescere, "to grow together") and seems at times to aspire to the condition of a natural object: perhaps a rock, bearing evidence of accretions, sediments and erosions. In her paintings formalism has "grown together" with natural forces, chance, intellectual courage, the inherent qualities of paint and the rhythms and reach of the body to produce powerfully suggestive works of alchemical transmutations and shifting forms."